First off, I get it. I get that we rely on the government to create a world that is fair for all of its citizens. We expect politicians to pass legislation that is in the best interest of the people. Because after all it is the people who elect these leaders, so it is only right that we expect them to work on our behalf. It is true however, that we often misinterpret the role of government in our lives particularly in America and we tend to put too much emphasis on what we interpret as failures in our government when it doesn’t necessarily suite the purpose that we feel it should. The misinterpretation of the American Government’s role in our lives could not be more prevalent than in the case of President Obama’s administration. The controversy surrounding his 18 months in office is unprecedented, particularly given the tremendous burden in which he inherited. Recently the President gave a speech at a Democratic Fundraiser in Manhattan, where he was heckled and taunted. Critics held up signs saying he’s broken promises and protesters yelled out that he has not given enough money for AIDS research. His speech was interrupted multiple times as audience members protested their causes. In a town hall meeting last week, the President was blasted by the middle class community. He was told that they were tired of defending him in the midst of high unemployment rates. It has been said time and time again, not only by the administration, but by many of his supporters, that the crisis this country is facing took many years to occur and that conditions will NOT change over night. Eighteen months is not enough time to clean up a mess as bad as the one America is in. It is outrageous and unfair to criticize one of the smartest presidents this country has had for taking too long to change a country which was single handedly brought to its knees by a man who was elected not once but twice! Enough of that though, let me get to the real reason why this post was written. It wasn’t written to defend the Obama Administration, or to convince people to vote democrat in November or even to stir up a stimulating debate. This post was birthed out of a simple concept. PRESIDENT OBAMA IS NOT YOUR SAVIOR!!! There is a large population of individuals in this country that are looking to Obama as the savior of the free world, in what can almost be described as a bit of hysteria. In 2008, during Obama’s Presidential Campaign there was definitely a wave of mass hysteria that swept across the country, which subconsciously divided Obama supporters into two categories, those that believed Barack Obama would help get our country back on track, provide black people with a greater sense of pride and dignity in the tradition of the civil rights movement and the black struggle and finally break the color barrier in yet another facet of American society. But then you had the fanatics, who believed Obama was something like the second coming. Someone who is both human and divine, whose purpose it is to bring a supernatural like power to the White House and with the wave of his hand he could magically make all of America’s problems go away. It is important that we understand what we are dealing with when it comes to those so-called Obama supporters who are getting “impatient” and feel that the president has broken promises and that he has not spent enough time on this or put enough money into that. Of course part of this has to do with what we refer to as the “black tax” however it is due mostly to the fact that many people thought Obama was something that he is not. PRESIDENT OBAMA IS ONLY A MAN. One of my favorite quotes during the Obama campaign was “we are the people we’ve been waiting for.” The greatest characteristic about President Obama, one that made me decide to leave my job to join his grassroots campaign, was his ability to inspire all those who followed him to initiate positive change in their own lives and into the communities in which they lived. Everyone has lost sight of this. His critics have forgotten that he has always made it a point to include us in his plans for change, by constantly eluding to us “doing this together!” Much of his platform consisted of him soliciting the help of the people to assist with initiating the change that we want to see. We cannot continue to rely on the government to do for us what we can do for ourselves. You will exhaust yourselves if you who claim to have legitimate gripes against the president’s lack of attention to your cause if you do not look past your self-reliance on a man and see what his message really is. Here is an example. One of my biggest problems with the American Educational System has always been that it raises children to graduate and beg for a job from some corporate CEO. The problem with this is that when the economy crashes and thousands are laid off and then even as the economy recovers companies don’t start hiring again, because they’ve realized they can function with the bare minimum amount of employees who are being overworked and underpaid, but endure because they are thankful to have a job. We become adept at begging for jobs but cannot figure out how to pursue our skills and interests in the context of creating a destiny for ourselves. When we begin to think in terms of building our own nation, rather than maintaining the establishment, high unemployment rates won’t matter because we have created jobs for those around us. How often has President Obama admitted how important the small business is? If we can begin to think about our lives in the way in which President Obama structured his campaign, I think we will have won half the battle. Neighborhoods came together and communicated with the larger city, which in turn communicated with the larger state, which in turn communicated with the larger country. The best interests of the people can be attained by working together with ordinary like-minded individuals to execute the vision you have for yourself. Complaining and waiting for government is not going to do it. We ARE the ones we’ve been waiting for. 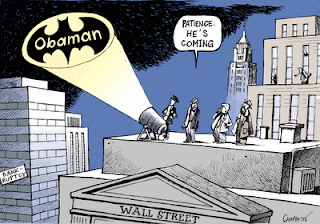 Stop waiting for President Obama to save you. He gave you the tools to at least meet him halfway.